Packed with super antioxidants and beta-carotene, these little lovelies will keep your skin glowing all year round. Although I'm not promising a total cure to wrinkles and age spots, sweet potatoes will help to repair some of the sun damage and ageing already there. 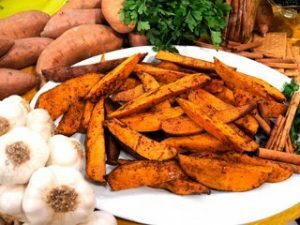 Great alternative to normal wedges – sweet potatoes are so much richer in nutrients than white potatoes and delicious too! Bake in the oven about 20 minutes and enjoy!